greatshoppingday2012 has no other items for sale. the base keeps leaking out the water you put in to weigh down item. Lamp works but the base had a small whole. Seller didn't help. Where have you been all of my life?! 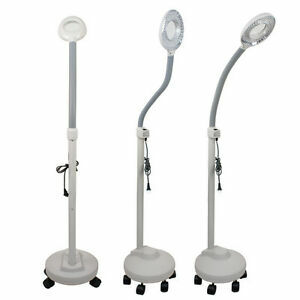 They list the product features as having a 5" clear and illuminating magnifying lens with a protective cover. The lens is 3" and there is no cover. It is supposed to have easy movement with 5 swivel casters, but one keeps falling off. The conveniently adjustable height and arm is not convenient. It takes some time to get it adjusted especially when you move it the wheel falls off. Once you spend the time and effort to get it right it works fairly good, but I really wish it had the 5" lens. This light is perfect for at home use. It is very light weight, but made well. The light portion lifts off the stand if you are moving it so hold base pole to move. The LED lights are not nearly as bright as they should be for the number of lights in the system. The magnifying glass works fine. I also like that it has five casters to help keep it from tipping when moving...six would be better. Pricing on this light is reasonable, but I would only recommend this particular light for home use. I would rate the lamp a 5 Star if the lights were brighter and the light portion of the system connected permanently to the base pole. it works great and if there is a draw back it is because you have to be sure it is balanced because of the small dimension of it's base but the small base is what makes it more versatile and fit in small spaces like what I need for my craft area this one doesn't have a lid but I don't mind that as I never use it for just light anyway got it together quickly and was using it right away. I love the cost is so much less that so many of it's type !! !